This week General-Lieutenant Vladimir Chirkin spoke to Krasnaya zvezda about several things. Recall that Chirkin is acting commander of the troops of the ‘Combined Strategic Command of the Red Banner Central Military District.’ He has been commander of the SibVO until now of course. His interview brought two things immediately into focus. First, it appears that OSKs will actually be unified or combined strategic commands rather than ‘operational-strategic commands.’ Either way the acronym is OSK. But combined strategic command connotes a couple significant things. They may really unify all armed services and branches on their territory for warfighting. Second, they are beyond the ‘operational-strategic’ level of warfare; they are intended to be strategic. In this interview, Chirkin was asked and talked at length about the scale and scope of Vostok-2010 in Siberia, as well as the performance of his troops in the exercise. Chirkin says the formation of his new OSK is not interfering with planned combat training at the brigade level and below. Recall in early June, General Staff Chief Makarov told the Federation Council three new armies comprising six brigades would be formed, and so it looks like Makarov’s old home, the erstwhile SibVO, and its massive territory in its new Combined Strategic Command of the Central Military District incarnation, will receive two of the new armies. Look for generals with a strong SibVO pedigree to command them. No indication of where Makarov’s third new army will appear. The Eastern Military District might be a good bet. As a postscript, Chirkin noted that the SibVO has gotten 4,500 apartments to distribute to dismissed or retired officers. Sound bites from General Staff Chief Nikolay Makarov’s press conference today dribbled out one at a time, as usual. Makarov told reporters President Medvedev signed a decree establishing four operational-strategic commands (OSK) to replace the existing military districts on 6 July, but the text hasn’t been published. Makarov also said arrangements putting the OSKs in place would be complete on 1 December. Makarov talked more about the new “unified system of material-technical support (MTO)” also apparently covered in Medvedev’s decree. Rear Services Chief, Deputy Defense Minister, General-Colonel Dmitriy Bulgakov, as expected, will head the unified MTO system, and new First Deputy Defense Minister Vladimir Popovkin will supervise the new state armaments program, 2011-2020, as well as coordination with military industries. 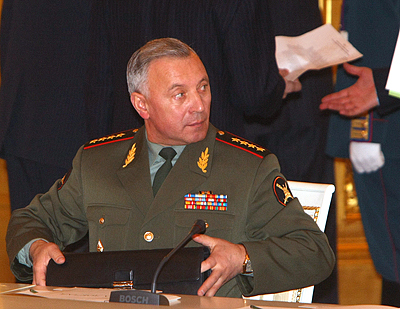 Popovkin’s old job of Chief of Armaments, Deputy Defense Minister will disappear most likely. Makarov told reporters Russia plans to move to netcentric command and control by 2015, once it equips its troops with new C3 systems united in one information space. Such systems are now scarce, but he says, they are working hard so to install digital equipment everywhere. Makarov calls this the main renovation that he’s giving all structures and troops starting in the fall of this year. He says Russia’s new command posts unite reconnaissance, target designation, and troops and weapons to execute combat missions in real time. It’s interesting that RIA Novosti took time to explain that the netcentric concept is an American creation more than 10 years old, and one not loved by those used to strictly centralized command and control. Makarov told the press the army will begin forming light brigades, which it currently doesn’t have, this year. They’ll have light combat vehicles of some type. While not providing details, Makarov emphasized that light brigades will be built around a standard vehicle, so that, as in Vostok-2010, a brigade can fly in and its personnel can marry up with their normal vehicles in their place of deployment. Answering a question, Makarov said Russia will buy more Il-78 tankers in GPV 2011-2020, but he didn’t specify a number. Makarov announced an intention to equip all Russian combat aircraft with new targeting-navigation systems over the next three years. He said the new equipment will increase the accuracy of air strikes and allow the Air Forces to “abandon the previous practice of area bombing.” He said the new system was tried on a Su-24M2 during Vostok-2010. Installation of the targeting equipment on the Su-24M2 began in 2007. Makarov said the VVS has nearly 300 Su-24 of all variants, and naval aviation about 60. Makarov added that one army would be based in Chita, and six additional motorized rifle brigades will be formed to flesh out the newly created armies. And Makarov wasn’t done . . . According again to Interfaks, Makarov told these members of Russia’s upper house of parliament that ten combined air (8) and naval air (2) bases will be established in Russia. Until recently, the military had been talking about new “first- and second-rank air bases” that were basically Air Forces’ equivalents of Ground Troops’ brigades. This approach may have been abandoned in favor of a smaller number of larger air bases. The choice of the word ‘combined’ [объединённые] makes these things sound like they’re now equivalent to armies. After this change, Russia will only have 27 airfields, according to the General Staff Chief, and the combined air and naval air bases will be spread out over Russia in cities like Voronezh, Chelyabinsk, Domna (near Chita), and Komsomolsk-na-Amure. He repeated his past comments to the effect that Mistral is 4-5 times bigger than Russia’s largest amphibious ship, the Ivan Rogov class. Tomorrow it’s Serdyukov’s turn to speak to the Federation Council, so prepare for some more news. On Monday, Olga Bozhyeva reminded readers the proposed OSKs were former Genshtab Chief Baluyevskiy’s idea, and she called them part of a command reorganization along an American model. She contends Baluyevskiy lost his job for pushing the change from military districts (MDs) to operational-strategic commands (OSKs). And now the OSK will apparently win out, even though Baluyevskiy’s long gone. Bozhyeva says Baluyevskiy and the shift to OSKs were defeated in the past by MD commanders [and their powerful patrons] who stood to lose out in the process. She claims Baluyevskiy’s opposition to the Navy Main Staff transfer from Moscow to St. Petersburg was a pretext for his dismissal when the OSK was the real issue. And his OSK experiment in the Far East was quietly dismantled after his departure. Actually, it’s more likely Baluyevskiy went down for opposing–rightly or wrongly–the whole range of ideas pushed by Defense Minister Anatoliy Serdyukov. By contrast, Baluyevskiy’s replacement has been a veritable extension of Serdyukov on policy issues. With Baluyevskiy gone, according to Bozhyeva, the MD commanders bent the OSK idea to their way of thinking, proposing to make every MD an OSK, without cutting or consolidating MDs, and duplicating efforts in the process. She says this reflected the MDs as ‘sacred cows’ upon which no one would encroach, and this tracked with new Genshtab Chief Makarov’s background as an MD commander. Recall that Baluyevskiy was a career Genshtabist. Bozhyeva continues, saying this year Makarov has begun to think about how to command the ‘new profile’ army. And wars of the future will hardly accommodate a command structure like the MD. But Bozhyeva reports a rumor that the name Military District could be retained to appease opponents of merging MDs in favor of modern OSKs. She concludes, if the OSKs are realized, it’ll be possible to talk of a really ‘new profile’ army. Dmitriy Litovkin also had his say on the OSK story last Friday. He describes the possible move to OSKs in terms of more responsive command and control, reducing the transmission of orders from 16 to 3 steps. But, he cautions, the OSKs are still just a proposal at this point. Litovkin says the military hasn’t tried to hide the fact that the OSK is borrowed from the U.S. concept. The main thing achieved in such an approach, he continues, is responsiveness in issuing and receiving combat orders. The Defense Ministry says this new OSK structure will be tightly tied to the new automated battlefield command and control system ASU TZ (АСУ ТЗ). Litovkin mentions how Prime Minister Putin saw ASU TZ at Voronezh, and how the system is supposed to centralize command and control down to the ‘electronic soldier’ on the battlefield. This fall brigade exercises are supposed to employ ASU TZ with the aim of controlling several hundred ‘objects’ in battle simultaneously. This summer the OSK model will be tried as part of the Vostok-2010 exercise in the Far East. Not a big vote of confidence for the new system. Litovkin concludes by saying the possibility of unit and even garrison relocations might be a limitation on the OSK scheme. Forces would need to be better balanced among the four strategic directions. For example, the Western OSK would have too many motorized rifle units and the Eastern too few.